Huh. That’s weird. Well, ASUS and Disney teamed up on a netbook, called the Netpal, designed to “make computing fun.” I thought a regular laptop with parental controls could do the same thing, but apparently you need an 8.9-inch display, Wi-Fi, and a locked down version of XP to really have fun. The Netpal is selling at Toys ‘r’ Us and Amazon for $349. Would you buy a full-bore netbook for your kids? The concept of kids computing has been sewn up so far by Leapfrog with their easy-to-use kids devices. This looks considerably more complex – and more expensive – and I remember a few years ago another manufacturer tried the same thing, a computer called the Disney Dream Desk. I don’t think the market was ready then and I doubt it’s ready now. Thoughts? GLENDALE, Calif. – June 17, 2009 – Disney Consumer Products (DCP) and ASUS, maker of the pioneering Eee PC™ netbook, have collaborated to develop the Disney Netpal, a netbook computer for children that’s fun, web-safe and easy to use. Developed with parents and kids in mind, the Disney Netpal by ASUS is durable, with a reinforced mechanical design, and offers a truly magical and engaging computing experience with a unique Disney user interface. Features include more than 40 robust parental control options, an 8.9-inch LCD display, Wi-Fi capabilities, Windows XP Home, and kid-friendly software featuring Disney characters and icons in stunning visual environments. Browsers and email have extra filters to assure that parents are able to control online safety and content for their children, and can easily select with whom their children can correspond via email. The Disney Magic Desktop “gadget tray” offers a creatively designed 2D menu displaying Disney-themed email, Disney-themed browser and a robust suite of Disney-themed parental control options. With a user interface that is incredibly easy to use for both kids and parents, from package to set-up in four simple steps, the Disney Netpal will be available in late July in two models with prices based on features (see graphic below for Netpal feature comparisons). The Disney Netpal by ASUS is designed for kids ages 6-12. Retailers include Toys”R”Us and Amazon.com, and the suggested retail price is $349.99. Carrying cases will also be available separately. Disney’s Toymorrow team is an internal group of Disney inventors, designers, engineers, researchers and product development experts. The Toymorrow team meets several times a year to brainstorm and develop new products and product concepts that focus on the convergence of toys and digital media in exciting, fun and creative ways. ASUS is an established leader in the netbook category and is widely credited with launching the netbook craze, with nearly 7 million Eee PC™ netbooks sold to date. The Disney Magic Desktop installed on the Disney Netpal by ASUS is an easy-to-use interface specifically tailored to kids, with an intuitive visual interface and instructions that make it easy for kids to operate the computer. Right out of the box, the Disney browser launches numerous kid-friendly Disney websites for kids to explore. The Disney Magic Desktop features a 2D “gadget tray” that displays bold visual icons for easy access to applications. Rounding off the Disney Netpal by ASUS’ fun, kid-friendly features are a collection of 15 easily-accessible widgets, including a stopwatch, digital memo pad, which inserts “reminder notes” on the Disney Magic Desktop, and a calculator. The Disney Netpal by ASUS features two choices of stylishly designed lids; Disney Princess Pink boasts beautiful pink florals and Disney Magic Blue cleverly displays rows of miniature Mickey Mouse icons. Kids can dress their desktops with more than 10 customizable themes inspired by popular characters from Disney’s and Disney∙Pixar’s most popular franchises, including Cars, Club Penguin, Disney Classic Characters, Disney Fairies, Disney Princess, Vintage Mickey Mouse, Toy Story and WALL-E. Themes that appeal to slightly older kids, such as Hannah Montana and JONAS The Series styles, are also available. Favorite character icons can be attached to email addresses. Additional Disney-developed applications include Disney Mix for music and media management, and Disney Pix for photo customization and organization. The Disney Pix application features fun Disney Bobblehead software, which lets kids insert images of their faces on top of bodies, download them into videos and postcards and play wacky moving dance scenes, for hours of fun. The Radio Disney widget streams real-time music and lets kids simultaneously submit song requests, if they wish. The Disney Netpal by ASUS also includes a driving game, number game, memory game and photo scrapbook. 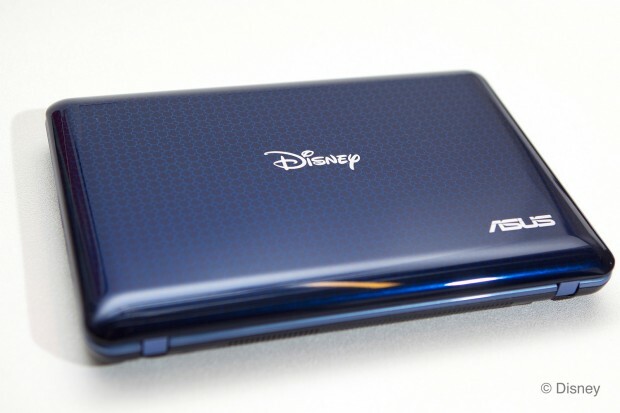 The Disney Netpal by ASUS is designed to be kid-friendly, both in terms of durability and content permissions. It’s rugged and durable, with a spill-proof keyboard that protects against inadvertent liquid spills. The Disney Netpal by ASUS’ ShockShield data protection guards against data loss when the computer is subject to impact. The Disney Netpal also allows parents to create a web-safe computing environment with 40 parental control options. Parents can pre-select email correspondence options, browsers, the websites their kids visit and the programs they use. These permissions can also be scheduled on a calendar, providing parents with a convenient, automated means of granting access on the days and times that they choose. Parents can also pull up data to determine where children spent time, and for how long. Additional websites can be added for access, but only if the parent approves and submits the request within the password-protected system.